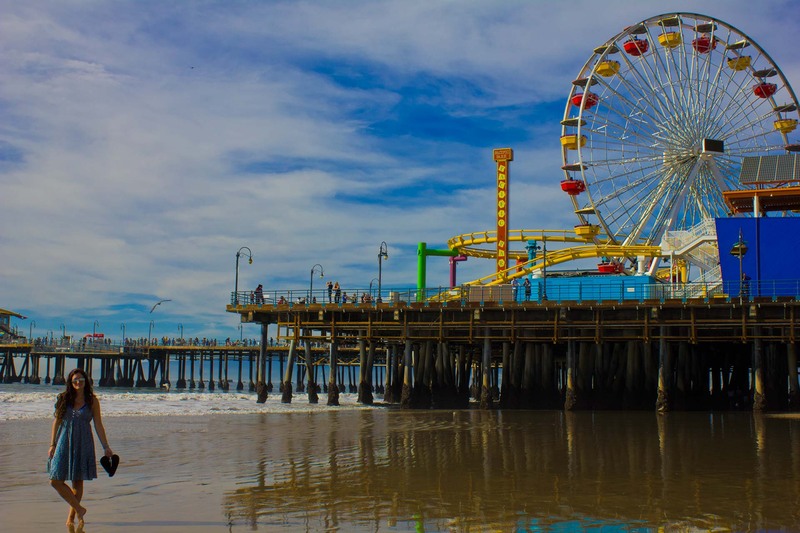 Countless movies and TV shows were filmed at Santa Monica Pier, CA making it a bucket list destination for many. Its famous wheel, cotton-candy skies, unique entertainers, golden sunsets, and clear, blue, ocean waves certainly lived up to the hype. 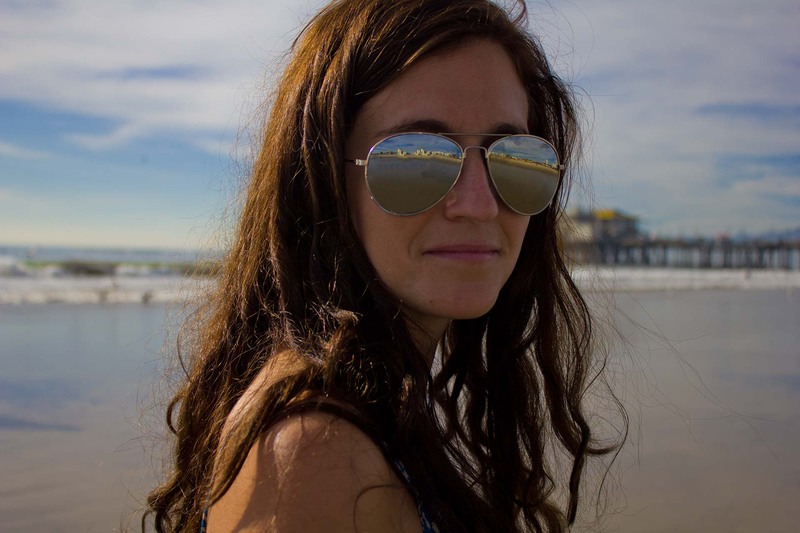 This entry was posted in California, California Outdoors, Travel, USA and tagged adventure, bucket list, Bucket List Publications, California, culture, Family, photo, photography, Santa Monica, Santa Monica Pier, USA, vacation by lesleycarter. Bookmark the permalink. One of my favorite places to hang out! Always something different to see. I used to live in the Palisades and always enjoyed mornings and late afternoons at and around the pier. So beautiful and can see why they chose that location to shoot movies and shows! My Bro lived up the road for 8 years and loved it! … Back here in the UK now though! Ahhh, GREAT memories!! Reminds me I need to take the kids back to play some more! Looks like a great place to have fun. Great pic…can’t wait to go back. What a beautiful sunset! The pictures are beautiful. Beautiful picture! Have fun Lesley! How beautiful and challenging! I’m too old now but a few years ago I would have loved it! My children and grandchildren would love it! Oh yah!!! I love these pictures, especially the top one of the wheel and the ride. Having been born in So Cal, oh, a while back, these pictures brought back many good memories, from a lot of different times of life… body surfing & riding the carousel as a kid, going there on dates after college, taking my family and kids there, and many times stopping in for a break while driving down Highway 1… thanks! My wife and I spent a truly magical evening on the Pier. Thanks for bringing back those memories. Beautiful photographs. I love California. Cannot believe it has been 27 years since I visited there. All the beaches iin southern California are cool. The beauty here never ceases to amaze me. 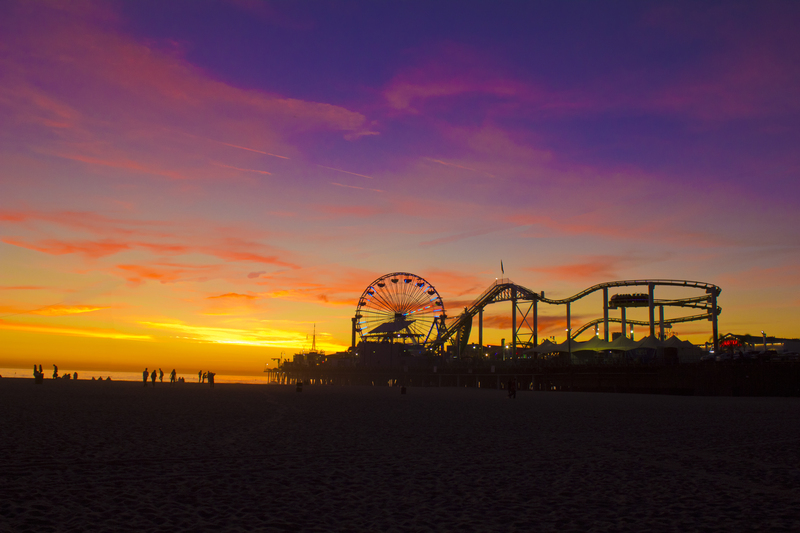 Santa Monica Pier is one of those sleazy, yet lovely places. Love sitting with a cocktail and watching the lights brighten as the sun goes down. Oh Gosh the one of you with the ferris wheel in the background is so pretty. 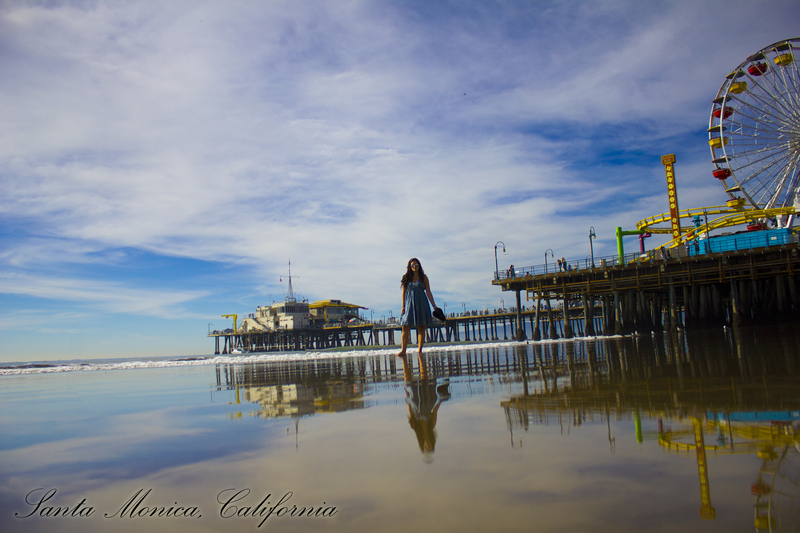 I grew up in LA… Santa Monica pier and beach were my fave places to hang out on Christmas morning–totally deserted and a great place for a pensive walk. 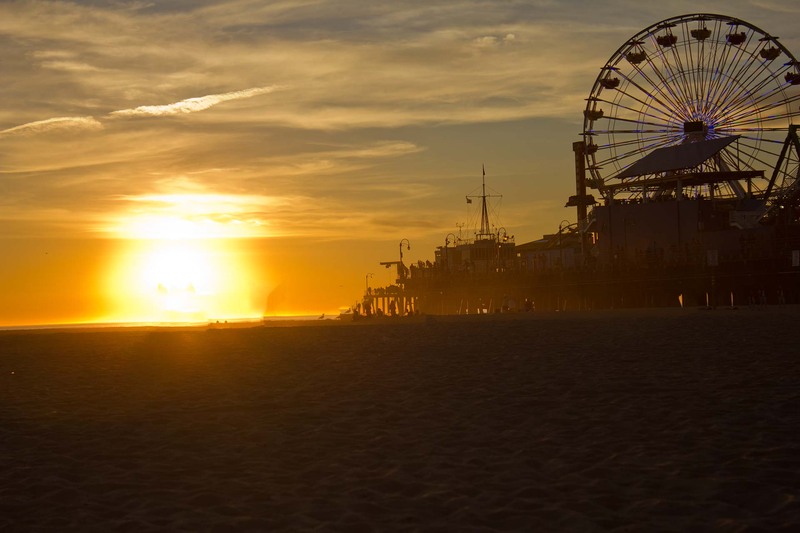 The sunset shot of the rides is great … the perspective created by the pier supports is off the chart. Great eye. Was just there a couple of months ago and loved it. Thanks for the post and photos. Very nice! 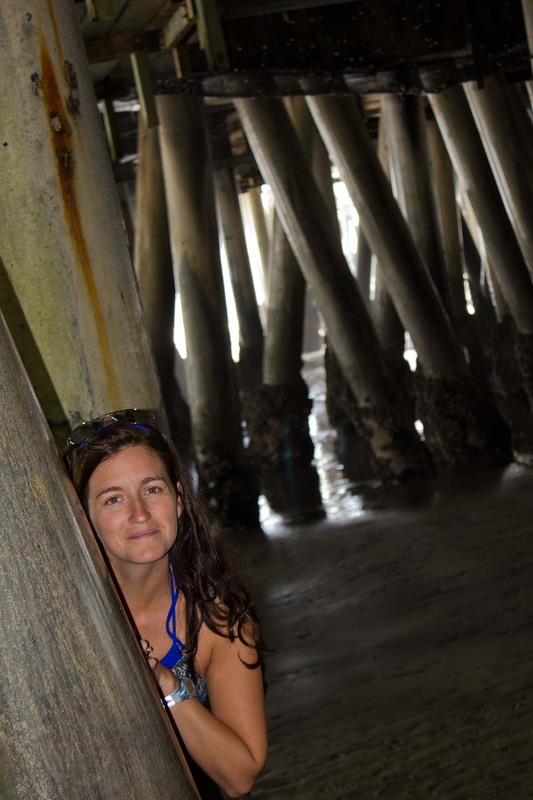 Love the photo under the pier! Great shots! Love the B&W under the pier. Nice. 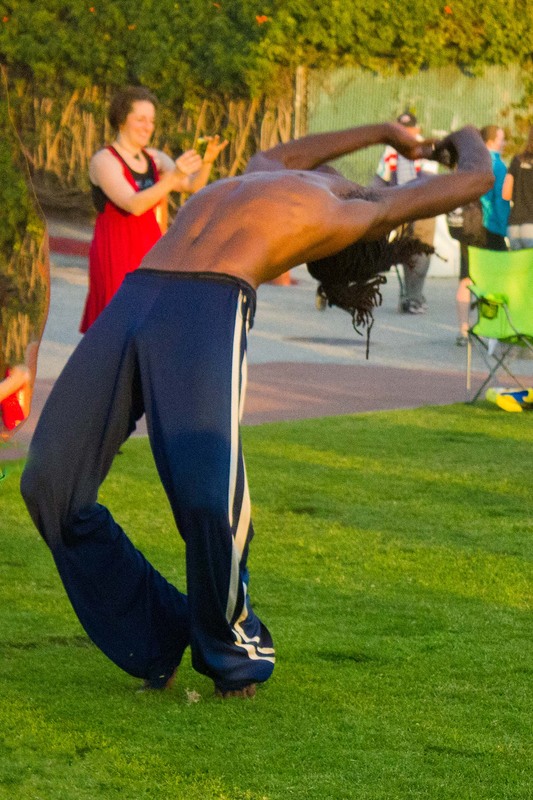 Never been to Santa Monica, but these pics make me really want to go. Great post! I am going to have to go there now… great pictures!! I love all the Photos!!!! Beautiful photos! I lived very near to this spot for three years and still love to drive up. I really liked your composition for the photo underneath the pier. Amazing photos! Amazing you in them! I am fascinated with clouds. I always take photos of all kinds of clouds when I go on a trip. I also love the way you say “cotton-candy skies”. Cheers!!! Great pictures! I’m living vicariously through your California posts! Nice work. 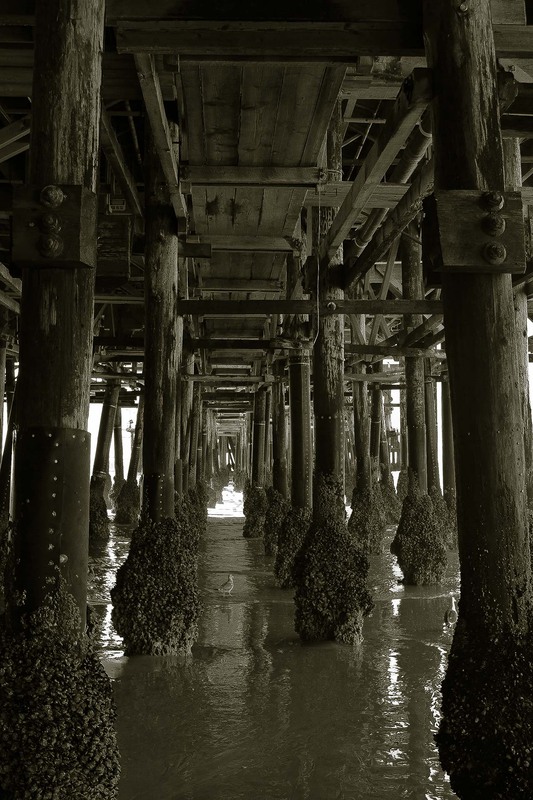 Amazing… the picture under the piers – wow! I have to go visit !!! These are wicked images on a drab grey Easter morning in north east England! Happy Easter to you. Hope all’s going well with the pregnancy. You look great! Bless you- I should keep up! Many congratulations Lesley. Bet the other half is besotted. Great shots of the pier! I worked for a great company (Intrepid) and led passengers up and down the west coast. The pier was always a great stop and they enjoyed the stories about movies filmed there. Good job on this post. It shows the life around the pier! I “pinned” two of your photos on Pinterest with a mention of your blog post. just beautiful. just spent the whole weekend down by venice and marina del ray … that whole area down there is too nice. great photos! The photos are gorgeous. I have never been to Santa Monica, looks very inviting! Nice pics. 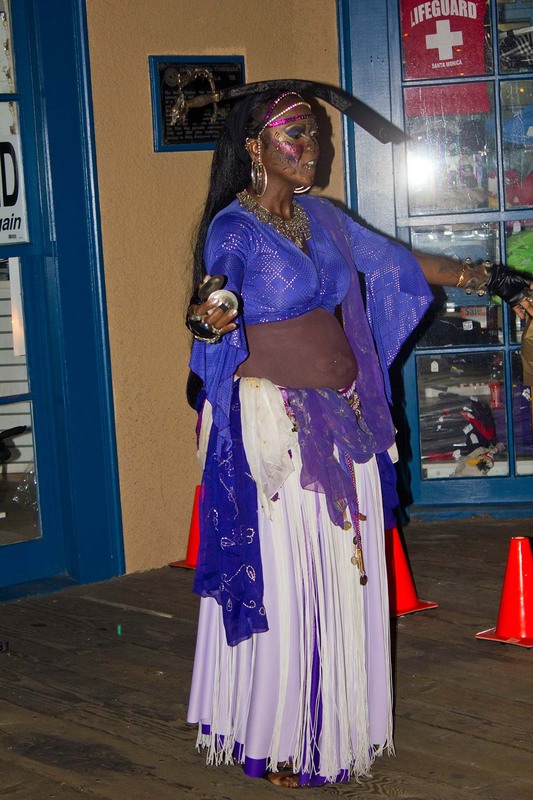 I go there all the time and never got that good of pics there…. 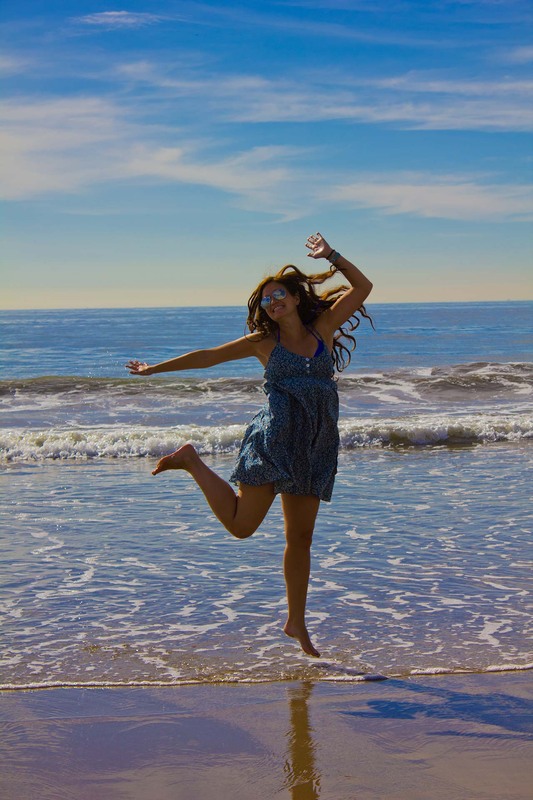 It is real fun there and if you are not feeling like getting sand in your socks, but want to enjoy, people watch, be wowed by a California beach sunset in comfort over a great lunch, dinner or cocktails then check out Shutters on the beach. They have great dinner restaurant called Pico 1, but I prefer the restaurant downstairs if you can get in… prepare to wait. Also next door, and great for sunset watching is the old Pritikin Center, now the incredible Casa Del Mar. Have lunch and take the short walk to the pier and the longer walk to Venice Beach to see the street people you always see on TV. No I do not work there or receive benefits, just sharing. BTW The Bucket List is one of my Faves… and gets my ♥♥♥♥ 4 heart award! Perfect weather, lots of interesting people, wish I never left! The west coast is the BEST coast! Nice pics! It wasn’t on my bucket list before, but after this post, I think it is!